Intensive French immersion course in the Lot & Dordogne, France! 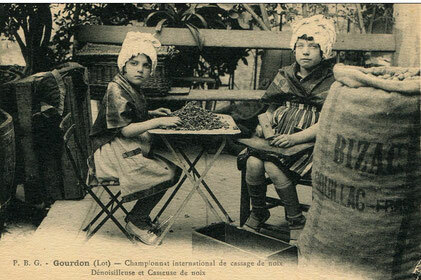 As walnut season comes around we take a look at the nut's history and its uses in the Lot and Dordogne areas of France. Walnut trees have thrived for a very long time in the Lot, the Dordogne and the Corrèze. Here, every part of the tree has its use and nothing is wasted: its leaves and catkins are used to make walnut wine; whilst still in its outer green husk (in June) it is used to make a liqueur; the outer green husk itself (in September) is used in dyes; its kernels are ground to extract walnut oil; its shells are finely ground to make a non-stick powder used by bakers in their wood-fired ovens; its fine wood is highly-prized by cabinetmakers. 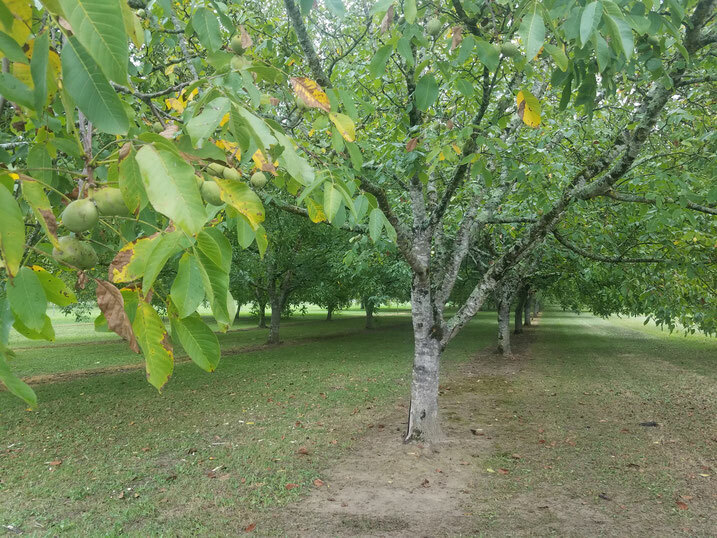 There are around 2,600 hectares of walnut trees in the Lot alone, making it the second largest producer of the Noix du Périgord AOP (Périgord Walnut PDO - Protected Designation of Origin). A walnut grove near Gourdon. Credit - Beatrix Murray. 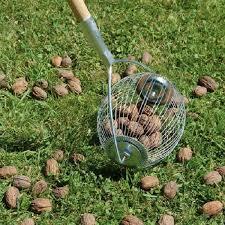 Before the advent of farm mechanisation, the entire walnut production and exploitation process was manual, including the harvesting through to the long work of cracking the nuts, called dénoisillage (shelling). Historically, walnuts were one of the region’s greatest riches, and an industry that employed a large workforce. 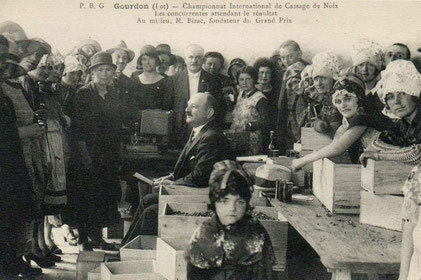 Gourdon itself was an important centre for the sale of in-shell walnuts but its speciality was walnut kernels. In August, merchants would call in women to carefully open the walnuts still in their outer green husks and to shell them in preparation for the oil press. Later, the walnuts were harvested again, riper this time, and they were shelled to avoid the cost of transporting worthless material. This activity was a valuable source of income for workers’ families or poor people. Shells were cracked all over the town, usually in the street outside the worker's home. As soon as the work began, festivities sprang up around it. In 1819, the idea of a special competition was born, with prizes for the most skilled dénoisilleuses or walnut-shellers and a banquet to bring the festival to a close (see postcards above). In the middle of the 19th century, after the walnut plantations were damaged by a harsh winter, walnut oil began its decline. Shortly afterwards, the emergence of new vegetable oils was the last nail in the coffin for this industry. Today, walnut oil is still produced but it is a relatively luxury product. Otherwise, walnuts are used in local cakes and breads and in salads, typically with Cabécou goat's cheese. Walnuts are still plentiful: it is possible to walk by a walnut tree overhanging the public right of way and collect arms full of fresh walnuts. Or a friend or neighbour might give you a bag full if they know you will appreciate them. Some tree owners leave the nuts to rot on the ground as they have so many! We can tell that the harvest is now only days away, as the farmers have cleared the ground around the walnut groves to make picking easier. The keen amateur might like to invest in a special ramasse-noix, which is a long-handled tool ending in a rotating cage. The fine metal structure is springy enough to let the walnuts enter but not leave. So with all these thoughts of delicious walnuts, here is a recipe for a tarte aux noix, typical of this part of France. It can make a delicious dessert with vanilla ice cream or a squirt of chantilly! If you find the video a little fast, you can slow it down in the video settings, found in the bottom right-hand corner. Copyright French Residential 2010-2019. Frenchresidential.com does not allow scrapers and automated harvesting of its webpages and will take whatever action is necessary to protect its resources.